I’ve done a lot of night riding over the past 12 months – including 300km audaxes through the night and the Transcontinental (a 4,000km self-supported, ultra-distance cycling race across Europe). Because of this, I’ve become obsessed with being REALLY visible, fixing up my bike and helmet with enough lights to look like a moving Christmas tree. When it comes to my cycling kit, I’m also keen to prioritise reflectivity and visibility, but I’m often baffled by the amount of apparel that has little or no reflective features. Yes, there are reflective options on the market, but these often come with compromise. For the gift of visibility, you have to contend with bulk and sweatiness, and for the joy of aero and comfort, you have to deal with virtual invisibility. No-one seems to have nailed it. Yet. Enter Metier’s Beacon jacket, a slick and stylish piece of kit that promises style, performance and ultra-visibility thanks to integrated lights. Could this be the answer to my time-honoured kit conundrum? To find out, I put it to the test on some seriously dark and dreary December nights. On paper, Métier’s Beacon Jacket is a pretty impressive piece of kit, providing protection from wind and rain with its “hydrophobic” quick-dry fabric, married with “thermo-regulation” to prevent overheating. Discreet, that is, until you turn them on. At 160 lumens on the front and 22 lumens on the back, they’re brighter than the safety lights I used to get me across Europe this summer and, according to the spec, have a very impressive burn time (up to 72 hours when on slow flash mode). Taking the sleek, all-black jacket out of its (very fancy) bag for the first time, the fabric felt strong but light, with a good amount of stretch. The brushed underside was wonderfully soft, and I loved the reflective strips on the rear panel and cuffs – generous in number but barely noticeable until they catch the light. My first ride with the Metier was a rush-hour dash across London on my trusty single speed, Roy, one wintry Friday night. I’ve been riding my bike in London since I was a teenager, with that including commuting, social rides and work as a courier, but riding through town on a Friday night still stresses me out. The roads are full of impatient drivers eager to start their weekend, and pedestrians are especially oblivious to anything other than themselves. It’s the time when I feel at my most vulnerable and least visible on the bike, so I was excited to try out the jacket and enjoy that extra in-built visibility. The Beacon is marketed as a road cycling jacket, rather than a stylish-on-my-ride-to-the-pub-bike-jacket, so it's unfair to criticise the jacket on these grounds. However, it did feel like a missed opportunity not to have incorporated reflective strips on the outside of the arms for occasions like this. This would also increase the jacket’s visibility from the side, which is something that’s often overlooked in cycling apparel. Once I got moving, the jacket kept me nicely warm with just a cotton t-shirt underneath – not bad considering it was a fairly fresh 7-degree evening. It also felt pretty comfortable and was never restrictive, regardless of what position I chose to ride in. My next ride with the Beacon was a night-time hill-rep session with my friend, Javi. Rather than slogging it up Swains Lane along with the rest of North London’s hill-seeking cyclists, we headed for two of Epping Forest’s finest hills: Mott Street and Avey Lane. To add excitement to proceedings, this was a multi-terrain trip featuring 10km of unlit gravelly towpath up the River Lea; painful hillly loops through the dark lanes of Epping Forest; then back into town via North London’s traffic-heavy suburbs. As we were bombing along the towpath, I could hear Javi behind me: “oooh… ahhh… woah…!” These were the unsolicited sounds of Javi’s approval. He was dead impressed by how bright the LED lights were and even more impressed by the reflective print on the cuffs and back. Javi does a lot of all-night riding and is a force to be reckoned when it comes to all things bike, so a thumbs up from him counts for A LOT. As for me, it felt really comfortable and, once off the towpath and plunged into the dark Essex lanes and suburban A-roads, I really enjoyed having the peace of mind of extra visibility. Unlike the first outing, this was one of those weirdly mild December nights, so I only had a summer baselayer and a short-sleeved jersey under the jacket. The jacket felt wonderfully soft on my skin and, as soon as I was moving, I felt pretty toasty in there. The jacket is also nicely windproof, although not as windproof as a soft or hard shell. While the favourable weather conditions meant I never got to test the jacket’s water-resistance in action, I did hold it under the tap in my bathroom and watched as water beaded beautifully off its surface. Even after 30 seconds under a heavy flow of water, the inside stayed bone dry. “Water-resistant” doesn’t really do it justice – it’s much better than that. Likewise, when it comes to the battery life it more than delivers – on constant beam it easily does the 12 hours advertised. Back to my initial question, 'is this the answer to that time-honoured kit conundrum?' For myself, the Beacon is a bit too “in-between”. For an endurance rider, it’s a touch bulky to stash in a jersey back pocket when I inevitably get hot, but a bit too thin to replace a soft shell or keep me warm if standing around. However, if you want a versatile jacket that passes equally as your elegant city-style cycling jacket and your mid-weight jacket for a more ‘serious’ ride, this is a really excellent spring or autumn jacket for you. It definitely has that wow factor, it’s well made, looks good, feels good and does everything it claims to do VERY well - water resistance, wind resistance, stretch and temperature regulation. 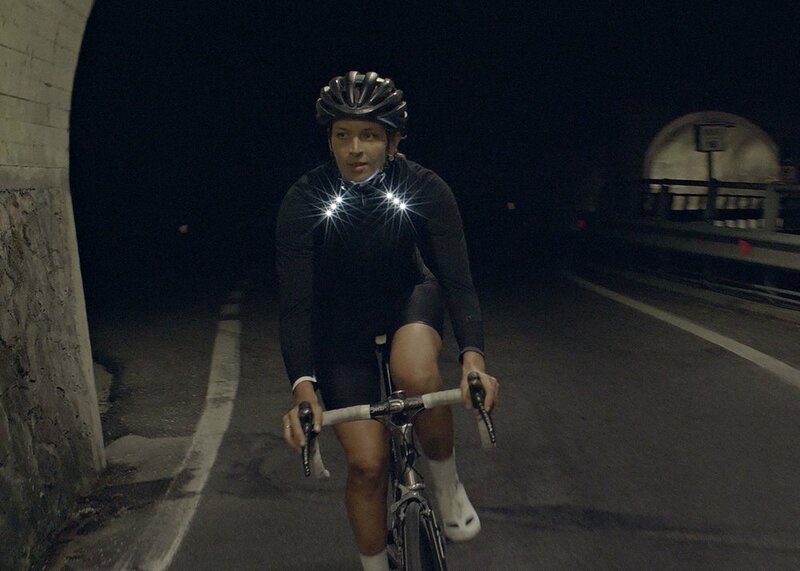 Importantly, it gives you incredible night-time visibility, with the graphite reflective prints a real strength. Bikes have always been important to me, but in different ways at different points of my life... for commuting, for holidaying, for work as a courier and – most recently – for racing. My weekends in 2017 were spent riding longer and longer distances as I prepared for the Transcontinental Race in August. Next year I plan to do more long-distance stuff and I try out road racing. You can follow my cycling-related Instagram posts here, and my blog posts here.